Hi and welcome to my new blog.... VR Puppet Builds ! I'm pretty excited to get all this going its been an idea of mine for some time now. The last few days have been setting up internet info, making new accounts etc ...... not so much of the fun stuff. 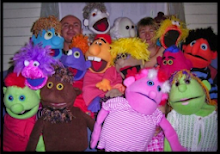 I first started making puppets back in 2004 and was inspired by a guy called Wayne in our church conference and to this day he still has a passion for christian puppet ministry. He says its a way of spreading Christianity and is a powerful tool! I totally agree because the years that my husband and I ran "Our Hands for Him" Christian puppet ministry we seen God move in many ways and if you are considering starting one I would say step forward in faith! We did and were amazed by how God guided.... from getting supplies to opening the hearts of the community. Although now we don't run the group I still see how a puppet can reach someone in a way sometimes we can't. So my purpose for this blog,YouTube channel, Face Book page,(don't forget to press like) Pinterest etc is to share with you what I have learnt over the years of puppet organizing, supplies, building and some performing, although I like the creative side of things best.... I also have an Etsy store under way which will soon have puppets for sale. So stay tuned I have a video coming up of how to sew a human shaped nose onto your puppet and a few free nose patterns. Be sure not to miss a thing by subscribing and or becoming a follower! Until then happy puppeting! that he has already given you the power to do! I have just discovered your puppet blog - I have no idea why it took me so long to do so as I follow your papercraft blog all the time! As a dollmaker I love that you make the puppets and also your tutorials are wonderful! I have put this blog in my favorites next to Valita's Designs & Fresh Folds so that I don't miss another post! Wishing you a great day!